Unfortunately a weather window has opened for me to take the big blue boat south to Long Beach so instead of flying out the sail on 40 Degrees in Rhode Island at the Atlantic Cup I have stayed here in Mill Valley for the weekend. The boat is ready to go and we are waiting for the tug to get up the coast – she is now off Monterey. This also meant I wasn’t able to do Spinnaker Cup. However, Racing Yacht Management client Tiburon came 1st in division and 3rd overall. Well done guys. The course record was broken and it was a wild ride downwind by all accounts. Wish I didn’t miss it. RYM spent the week prepping the boat to comply with the offshore rules including category 2 ISAF for the upcoming Coastal Cup. The race council at SFYC did a superb job of on the water pre start safety checks including ensuring that all crew were wearing lifejackets with crotch straps attached and being worn. An entire crew had to be reminded that crotch straps in their bags were not of use should they fall overboard. Another crew had forgotten their lifesling so had to quickly return to their dock to retrieve theirs. Thank you SFYC race volunteers for encouraging safety offshore. One of the boats with three SFYC ISAF trained crew aboard had a MOB off Pigeon Point and recovered the person in 5 minutes. They credit the training to safely recovering the MOB. Brought a smile to my face and makes all the volunteer hours well worth it. Racing Yacht Management clients filled the podium at Aldo Alessio Regatta in SF. Well done Adam, Shannon, Barry, Steve, Bruce, Rolf. What RYM did on the boats made no difference to their winning ways that is for sure. I was aboard a new client TNT in the IRC division. IRC seems to be struggling in the Bay and has been for some time so we were all lumped into one class. There are only a handful of sailors in the world that know what it is like to sail these boats and an internal review by the people who understand the monsters is the only way to do it. The multitude of posts are pure speculation, as is what I am about to write. I have been asked what I think went wrong. I have never sailed these boats and never will I have no knowledge of the conditions aboard the boat. However, there are a few things that I believe will be reviewed in the accident investigations. 1) The engineering/scantlings of the boat. 2) The issue of entrapment – it might be found that ironically having no flotation device is a safer option than having any. The type of knives on the crew members body. 3) How to get larger amounts of emergency air aboard the boats. There is a problem with the boats being so fast that rescue divers might not be able to get there quickly enough. Teams might also need as many rescue divers as sailors to make sure every sailor is gotten to quickly. 4) Development of a single standard operating procedure for crashes followed by all teams. There are a lot of safety measures in place so maybe there are already enough and the procedure wasn’t at fault but I am sure that will be investigated so the all the teams learn. Maybe infrared cameras would be more efficient at finding sailors quickly instead of a search. However, I am not an expert and I do know water shows up as black so maybe that wouldn’t work. 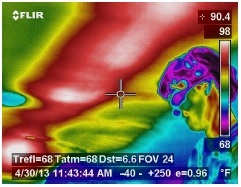 In the below picture you can clearly see my outline when I was helping during thermal scanning of Darling two weeks ago.